This year marked the ten-year hurdle since Jacob returned to Heaven and left us to fulfill his declaration of unknown fame. The year also timed a realization of how Jacob’s Project fulfills his legacy: exploring, learning, and caring. For years, efforts to share Jacob’s story focused on how he died in order to try and prevent a similar tragedy from happening. 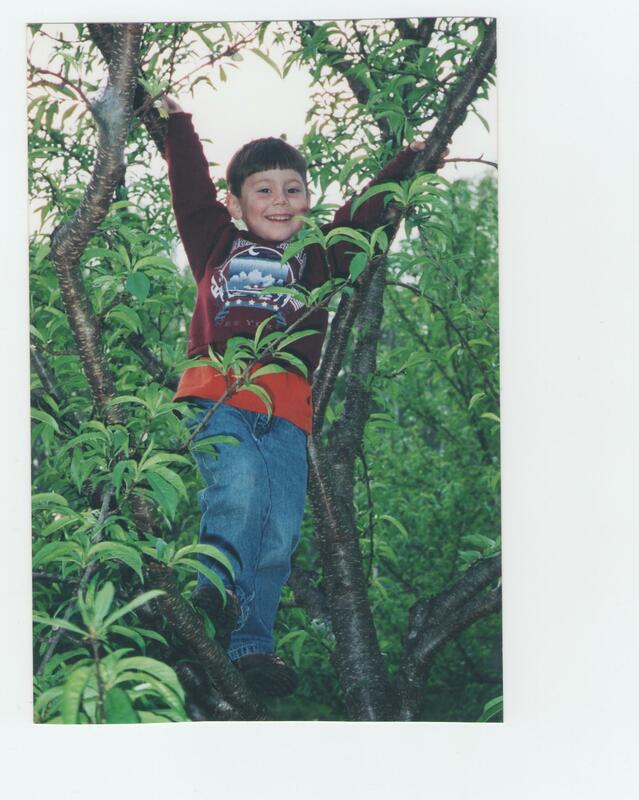 Now, his life-story of exploring, learning, and caring is more complete with the accomplishments and goals from 2014 at the environmental education park. In early April, the accomplishments of the Sinking Creek Restoration Project and the plans for the environmental education park were presented to a standing-room-only audience at the 2014 Tennessee Environmental Conference. Gary Barrigar, who is Project Manager for the Boone Watershed Partnership (BWP), joined Bill Francisco for the presentation. Afterward, a representative of General Shale expressed particular interest, and we foresee a partnership with a walkway and outdoor classroom in the near future. Also at the Tennessee Environmental Conference, Chris Greene, who is an ETSU doctoral candidate in Environmental Health, presented his ongoing research with specific E. coli identifiers throughout Sinking Creek. We look forward to reading his thesis paper in Spring 2015. Jacob’s Project highlighted April during Earth Week with the annual Jacob Francisco Memorial Century & Awareness Walk hosted by the Tri Cities Road Club and the Johnson City Morning/Evening Clubs. Kroger on State of Franklin, CopyNet Business Center, Knight’s Pizza, Piney Flats Bicycle & Fitness, and many other local businesses made in-kind and cash donations for participants and volunteers to enjoy snacks and beverages, t-shirts, and door prizes. Hundreds of people came out to bike, walk, and volunteer to raise awareness of how to prevent dangerous E. coli bacteria contamination and to raise funds for Boone Watershed Partnership’s account for developing the environmental education park at Sinking Creek. The event raised a few thousand dollars, which enables BWP to build a portion of boardwalk over wetlands. Morgan Moseley, who was 2014 Miss Tennessee Teen, chose Jacob’s Project as one of her community-service platforms during her reign. She raised awareness about Jacob’s Project at Indian Trail Intermediate School, Jacob Francisco Memorial Century & Awareness Walk, various state-wide appearances and media outlets. She proudly represented Johnson City, Tennessee and Jacob’s Project through the semi-final round of the Miss Teen USA pageant in the Bahamas. Shortly after Jacob’s Bike Ride & Awareness Walk, a wonderful meeting took place with Chris Meadows and his management team from the Lowe’s Home Improvement Store of Jonesborough. They visited the park site and got very excited about building some hiking bridges across Sinking Creek through the Lowe’s Heroes Program. They anticipated autumn construction, but some unforeseen circumstances pushed construction to Spring 2015. Getting across Sinking Creek on a beam with a rope handrail, Connie Deegan, who is the Parks Naturalist for the Johnson City Department of Parks & Recreation, continued working with ETSU students and inmates from the Washington County Sheriff’s Office to plan and build hiking trails. There is now a pretty nice one-mile-ish loop to hike the forested ridge above the Sinking Creek wetlands, while other trails are in the making. 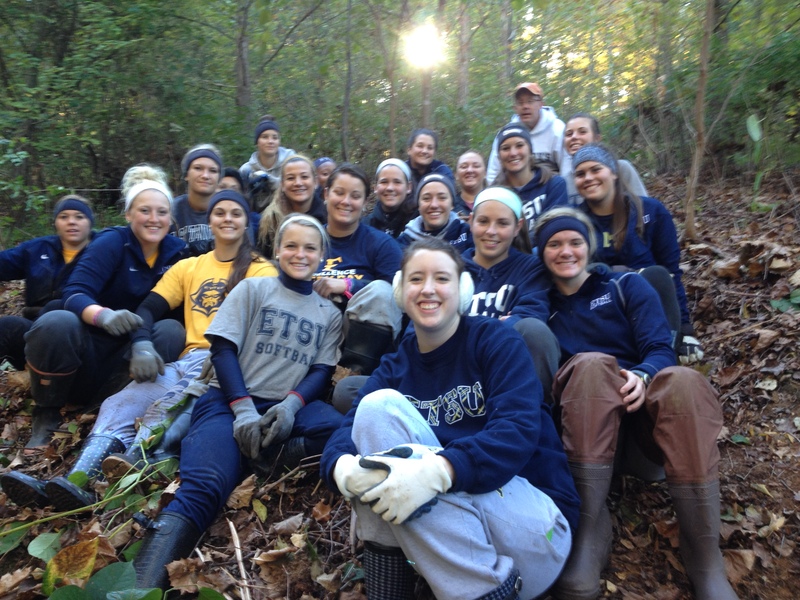 The ETSU softball team and the PKA social fraternity from ETSU cleared a lot of brush, invasive plants, and trail during the early weeks of fall semester. Throughout the summer, Jesse Anderson, who is a Science Hill High School student, was building three trail benches in pursuit of his Boy Scout Eagle Merit Badge. On a hot summer day, he took his parents and his Scout troop to place the benches in holes filled with bags of cement. 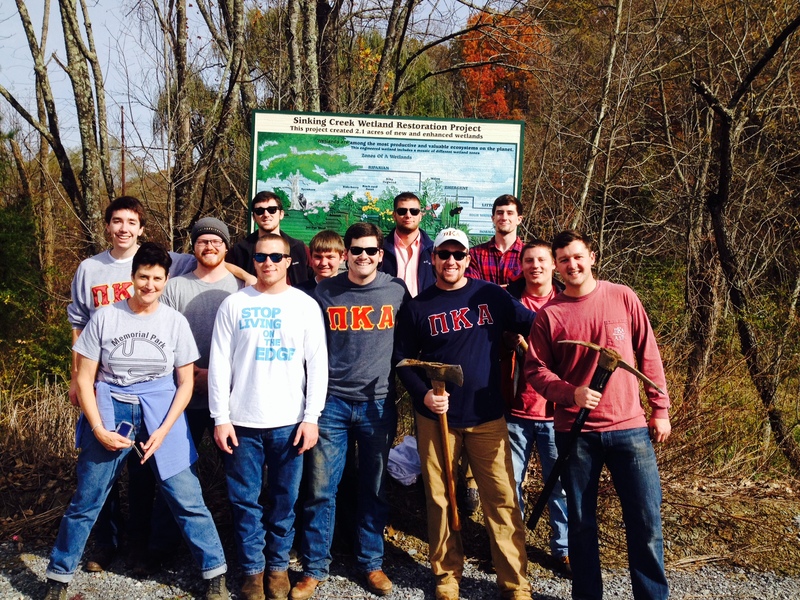 It was a very physical, worthy community-service project that will be appreciated for generations to come. Wood for the benches was donated by Historic Flooring owned by Steve McKinney in Johnson City. Steve is excited about the project and may be a partner with the construction of the outdoor classroom in the near future. One setback turned into a goforward. The Johnson City Power Board had to complete some line-maintenance through the park site this summer, and it created some big trenches in the wetlands with its machinery. The tree-cutting was also pretty shocking. With regret that a stronger relationship with JCPB hadn’t been established already, Jacob’s Project gained a new partner in park development. Rodney Metcalf, who is the JCPB Chief Operations Officer, is now more aware of the park development and has committed JCPB to donate old utility poles for boardwalk construction. It is anticipated that the poles will be dropped at the park for some construction in Spring 2015. The BWP grant applications for funds to build boardwalk, bridges, an outdoor classroom, and educational signage submitted to Tennessee Department of Conservation (TDEC) Healthy Watershed Initiative and the Tennessee Department of Agriculture (TDA) 301 Program received little financial acknowledgment. TDEC denied any funding, and TDA granted approximately $20,000 for educational signage. BWP, Jacob’s Project, and JC Parks & Rec have already met with ETSU faculty to work with them and their students of the Interpreting Nature class to fulfill the purpose of the TDA grant. Although the grant applications for infrastructure were denied, the process forged new future partnerships with the Tennessee Department of Corrections and the Washington County Sheriff’s Office for in-kind labor when we can afford the materials and begin building. Jacob’s Project was recognized with the “2014 Governor’s Environmental Stewardship Award for Excellence in Education & Outreach,” and was recognized as a “Friend of Nature” by the Johnson City Department of Parks & Recreation. Now, we need to learn how to turn that recognition into about $100,000 to complete the construction of over 1000′ of boardwalk, another bridge, an outdoor classroom, and purchase benches and picnic tables in the near future. Please join us for a bike ride and walk to raise awareness and raise funds for Jacob’s Nature Park at Sinking Creek during Earth Week on Saturday, April 18, 2015. In the meantime, please continue your support and share this webpage and Jacob’s fb community page to show your enthusiasm and interest. Finally, make a tax-deductible donation online at http://www.boonewatershed.org and name “Jacob’s Nature Park at Sinking Creek” as the donation purpose, or write a check to “Boone Watershed Partnership-Jacob’s Nature Park,” and send it to BWP, c/o Matt Dake, 578 Beaver Creek Rd., Bluff City, TN 37618. Felicidades a los esposos BILL FRANCISCO Y JUANITA FRANCISCO por la lucha perseverante de no permitir que la memoria de su querido hijo se pierda ya que Jacob estará siempre en los corazones de cada uno quienes lo conocimos ,desde que partió al Cielo y nos dejó de cumplir su sueño.